Here it is folks! Finally! 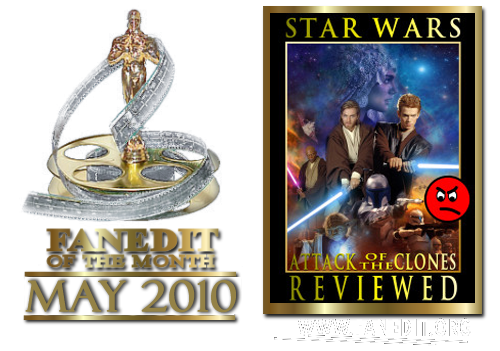 My epic review of Star Wars: Episode 2 Attack of the Clones. Part review satire, part parody, part commentary, all prequel hating vitriolic comedy. This transformative work delves into this film in detail as well as more general topics about why the prequels didn’t quite “work” for most audiences. Part one is an overview about expectations and how the audience is left in the dark to fend for themselves as far as figuring out what’s happening in the movie. by boon23: why bother downloading this on DVD, when all the videos can be watched online? Well, basically because the converted youtube videos look better on the DVD and to enjoy the entire thing on your TV screen in widescreen format and not in the crappy youtube format. This review is so strong that it can be truly enjoyed as a feature film. So, grab some popcorn and have some true fun with your friends watching a hillarious way to review one of the worst Star Wars movies ever. Share the pain. :) for the DVD creation I used avisynth and virtualdub filters to get rid of some noise, corrected the black levels (as the youtube videos are very milky), cropped to what was possible for a widescreen format (sorry for the sidebars, but it was either that or full-screen), changed the format where it was necessary to properly display fullscreen scenes, converted carefully to mpg, created cover art and DVD menus for a neat presentation. overall I think the quality is really ok considering the youtube source. This one will not be watched for its awesome sound or video quality, but for its awesome content. The original creator has not been contacted by me for higher quality source files or for his very own DVD version this time, because he did not respond last time (except for asking if we intend to sell his work), so this was given up. second part of the redlettermedia star wars prequel reviews is as much like the first edit. there are a lot of valid points made by the viewer many of which have incorporated into fanedits. your either gonna like or dislike the humour and as with the first part the sub-plot can be a distraction. luckily these can be easily skipped as they appear at the end of each part. while i do overall enjoy these reviews i do however feel they spawned many imitators who seemly look to nitpick and criticize a film. Like his Ep 1 review, I found this droll and insightful although not quite as funny. I think that’s because uncovering the many faults in Attack Of The Clones is a more complicated affair, and thus Redlettermedia has spent more time on serious anaylsis. I dislike both prequels equally, but I always did find it harder to poinpoint the reasons why I found Attack Of The Clones such a failure. Nice work.